As teacher for 27 years of French, Latin and Ancient Greek near Montpellier, I often took my pupils to Greece, but I always had to disappoint them by admitting that I could not interpret for them, nor translate the newspapers, other than a few words. I found it ridiculous and irritating: therefore I promised myself that one day I would get down to studying modern Greek. That happened two years before I retired. The achievement of this aim revealed to me an unknown world and launched me on an adventure which will endure, I hope, for the rest of my life. I began my studies with individual tuition by a Greek woman living locally. Gradually she became one of my friends, and her relatives, living over there, are now my “ Greek family ”, who I am delighted to see during each of my trips. Then, at the Paul Valery University of Montpellier, I obtained two Masters Degrees in modern Greek ( “ Cultural studies ” and “ Professional translation ” ) while, at the same time, passing each stage of the “ Certificate of knowledge of the Greek language ”, equivalent of the English TOEFL and the French DALF. I still read Greek and watch Greek TV every day. Moreover my studies have introduced me to the literature, history and civilisation of contemporary Greece: like the vast majority of French people, I was almost totally ignorant of this. My school trips being limited to the classic tour of Ancient Greece ( Athens, Epidaurus, Mycenae, Olympia, Delphi ) certainly fascinating places, but which I eventually knew like the back of my hand, I developed the desire to discover the rest of the country by departing from the beaten track. This choice obliged me to reject the security of organized tours. I even decided to set out alone ( requiring great willpower at first ) to have complete freedom of movement and the ability to converse with the locals. In fact, I noticed that one can launch into conversation with someone much more easily as a lone person than as a part of a couple or a group. Never setting out in the summer, for fear of the heat, I have no problem in making reservations, and also the Greeks have more time for me. But I admit that I meet very few tourists travelling alone, and virtually no women, especially of my age. However I have never felt unsafe anywhere. Of course it is better to avoid some quarters of Athens at night. Since 2009 I have undertaken a systematic and detailed exploration of all corners of Greece, province by province, during two or three trips a year, each lasting three weeks. Equally I have visited those regions which have a rapport with Greek history : Sicily, Cyprus and Istanbul. All the places I talk about are dealt with to some degree in the reputable guides, which give descriptions and itineraries. But when I arrive in a town or an island I buy a local guide which is much more detailed. Having discovered so many unknown places and adorable people, I wanted to use my experience to benefit those tourists who wish to know an alternative Greece. Thus I hope that they will want to follow in my steps and get to know this country more minutely. By such a provocative title, I am poking fun at the ignorant comments and clichés which foreigners heap on this country. A Greek innkeeper told me that his Dutch guests think that only the coasts of Greece are inhabited. In contrast, I met a Greek hotelier who was convinced that France doesn’t have a coastline ! One day, in France, in a book club where I was presenting the Greek books I’ve translated, I evoked the fact that the only generally-known history of Greece is that of Ancient Greece and that 99% of the French, even the well-educated, were unable to place, to within 30 years, the date of Greece’s independence (1830). A lady of a certain age, a keen reader, then said “But independent of whom?”, thus showing her ignorance that Greece had been occupied for 400 years by the Turks. Some place its independence in 1974 (fall of the Colonels’ dictatorship). We know very little about the Byzantine Empire, especially that its official language was Greek. However, this period is, for present-day Greeks, as important to their culture as the Greece of antiquity. My generation all know the film “Zorba, the Greek” and its famous sirtaki (a dance invented for the film! ), but hardly anyone knows that it is based on the novel “Alexis Zorba” of Nikos Kazantzaki, a work far more rewarding than the film. One forgets completely that Greece has two Nobel prizes for literature, both for poets, George Seferis in 1963, and Odysseas Elytis in 1974, the latter only known by the fans of Angélique Ionatos, who sings his poems. Note that I’ve even met a librarian who admits to being unable to cite a single 20th century Greek author! But these same ignorant foreigners love to read non-Greek authors writing novels set in Greece: a certain Raphaël Navarin amongst lovers of German and (especially amongst English enthusiasts and ourselves) Victoria Hislop, who’s sold a million editions, whereas contemporary Greek authors rarely exceed 3,000 here, save for Petros Markaris because he writes crime novels. 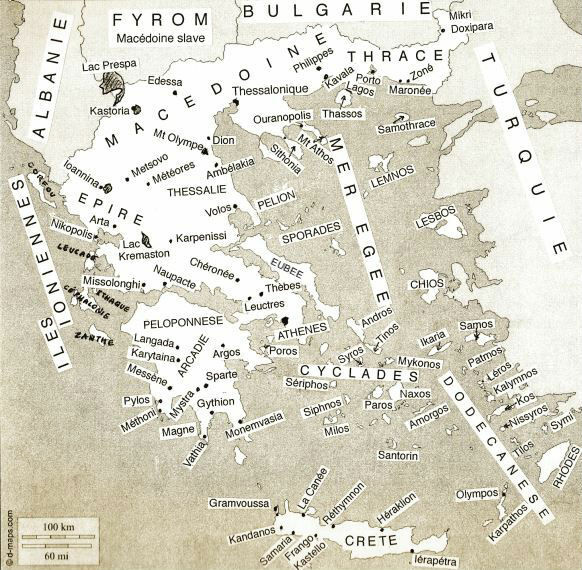 As for its geography, one would hope that the majority of French would know where to place Greece on a map of the world. 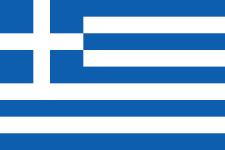 However, many mix up Crete and Cyprus, thinking that the first is an independent country, or even don’t know whether Thessalonica is a town (it’s the 2nd biggest in Greece) or a region; at least it’s something when they know the name. To conclude about my compatriots’ ignorance and to pour some balm on their wounds, one should know that the Greeks think that, as far as foreigners are concerned, the French are the ones the most interested in culture.